A balanced diet fuels muscle-building workouts. When it comes to getting bigger muscles, you probably assume you need large amounts of protein. But the truth of the matter may surprise you. “Natural Anabolics” author Jerry Brainum has stated unequivocally that you don't need protein to gain muscle. What your body needs is amino acids, and there are plenty of places to get them. MayoClinic.com’s Katherine Zeratsky, R.D. 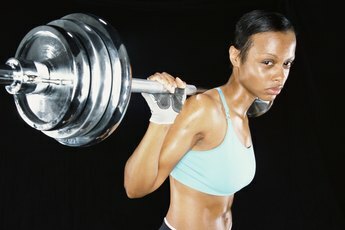 says that “unless you are doing high-intensity training, you probably don’t need any extra or recovery calories, electrolytes, carbohydrates or protein.” What's most important for getting bigger muscles is stimulating muscle growth in the gym and then providing adequate amino acids for recovery. Do three to four sets of a compound exercise to start your workout routine for each major muscle group, says “The Ultimate Power-Density Mass Workout” by Jonathan Lawson and Steve Holman. Some examples of compound exercises include squats for the legs, pullups for the back, bench presses for the chest, upright rows for the shoulders, biceps curls and triceps push-downs for the arms and leg press calf raises for the lower leg. Do three to four sets of a stretch exercise. Stretch-position exercises have shown to increase muscle size by 300 percent in a month in one animal study, say Lawson and Holman. Examples of these exercises are sissy squats for the quadriceps, stiff-leg deadlifts for the hamstrings, dumbbell pullovers for the back, dumbbell flyes for the chest, one-arm inclined laterals for the shoulders, overhead triceps extensions for the triceps, incline dumbbell curls for the biceps, and donkey calf raises for the calves. Finish each muscle group with three to four sets of an isolation exercise. Examples include leg extensions for the quadriceps, leg curls for the hamstrings, straight-arm lat pull-downs for the back, cable crossovers for the chest, lateral raises for the shoulders, rope triceps push-downs for the triceps, concentration curls for the biceps and standing calf raises for the calves. Get 40 to 90 seconds of time under tension per set for muscle size gains, says fitness expert Jim Stoppani. For example, if you do 10 repetitions, each rep would need to last approximately four seconds. By controlling repetition speed, lowering the weight in three seconds and lifting it in one second, you can make sure to get ample time under tension for your goal. Take five to 10 grams of BCAAs or branched-chain amino acids split before, during and after your workout, recommends Brainum. These special amino acids play an important role in building muscle. 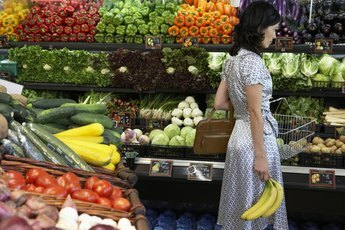 Eat whole foods like fruits, vegetables and whole grains, as well as drinking plenty of water, says MayoClinic.com. Also, consider adding protein alternatives like beans and legumes, tofu, tempeh, Seitan, quinoa or nuts and seeds to your diet. Always remember to do a brief warm-up and cool-down before and after each of your workouts. Consult with your doctor before changing your diet, supplementation and exercise plan. 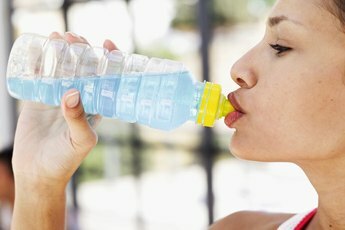 MayoClinic.com: Nutrition-Wise Blog: Are Sports Supplements Sabotaging You? ; Jennifer Nelson, M.S., R.D. and Katherine Zeratsky, R.D. How Much Protein Do Female Rowers Require? Can You Get Big Arms With 8 lb Dumbbells?